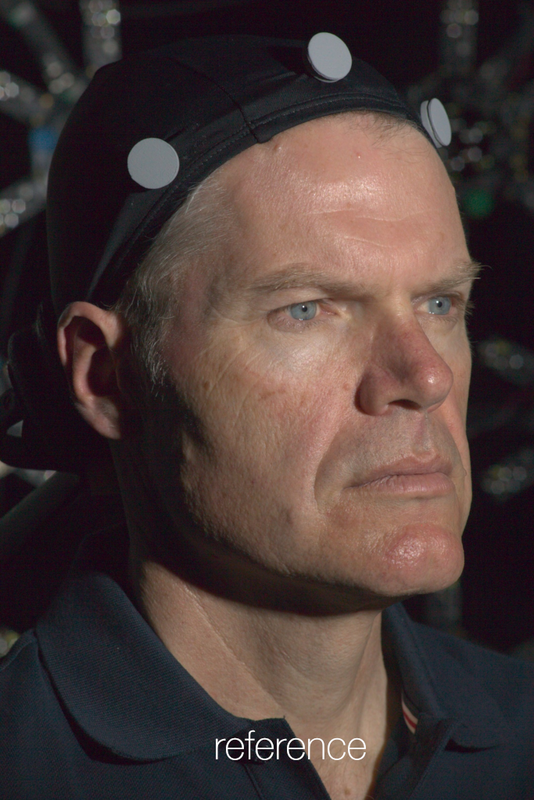 Der Spiegel article on Digital HumansFX Guide follows up on eye scanning research. 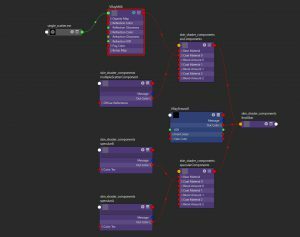 Not long ago, Chaos Group implemented the Anders Langlands’, newly open sourced, alSurface shader for V-Ray. For a more complete story on why and what we did, read the Chaos Group Labs post on it. 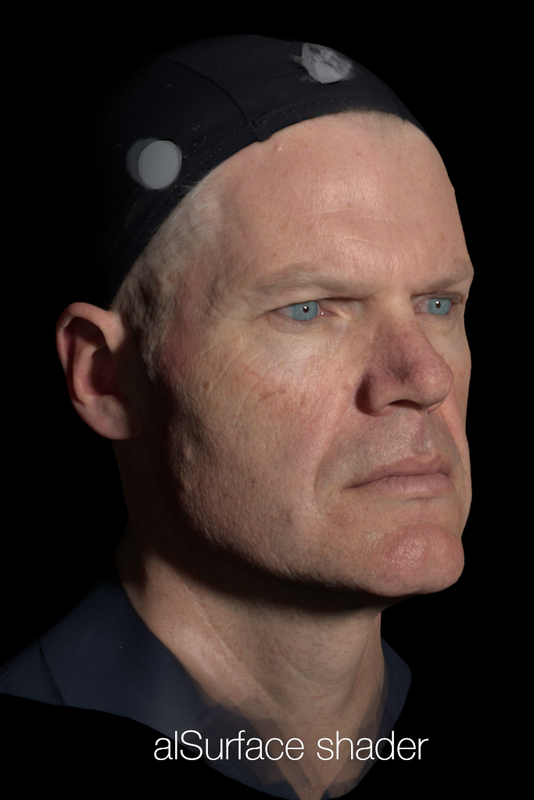 Based on some of the implementations it was wise for the Digital Human League to test the new shader against the Wikihuman shader developed during the our work on Emily 2.1. As you may know the Wikihuman shader was build based on reverse engineering the data acquired from the Light Stage data at ICT. However, the Digital Human League always knew that a few compromises were made, such as how it used the single scatter map and how the specular was added on top. At the same time, it was fairly simple and clean and meant to be adaptable to any rendering solution. 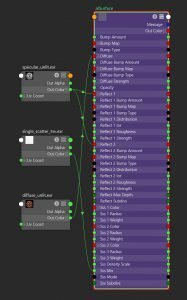 When we looked at the new alSurface shader we believed that it was well suited for the Light Stage data out of the box. Therefore, we decided to explore how it would treat our current Wikihuman data. For a description on how this data fits into the Wikihuman shader developed earlier, please refer to this earlier post. 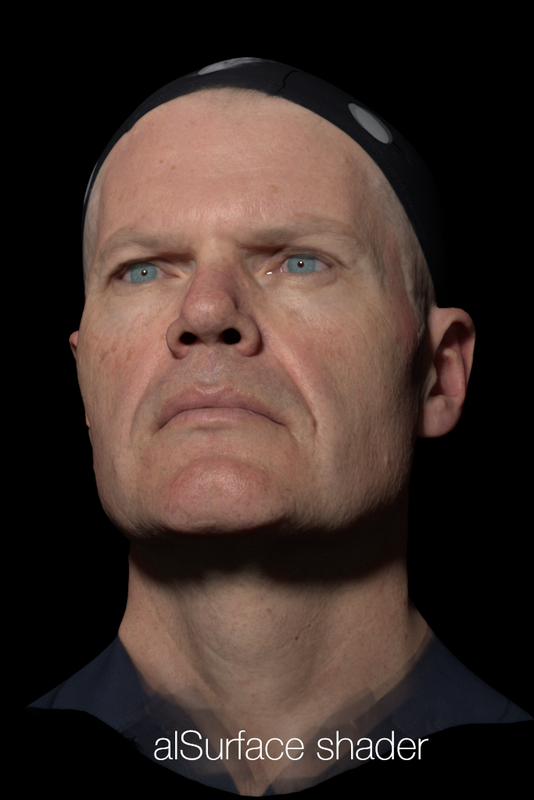 As we are in the middle of developing a new data set, Digital Mike, which is based on a scan of Digital Human League member Mike Seymour, we decided to use it to test the new shader. Diffuse: The original Wikihuman shader mixed in a pure white lambertian diffuse though the single scatter map. It did this by compensating the “diffuse” map to be darker and more saturated and separated the SSS and diffuse contributions. The alSurface shader uses the same color map for SSS and diffuse lambertian contributions and uses the single scatter map to separate how much of the light is a deep scatter and how much has a single scatter. 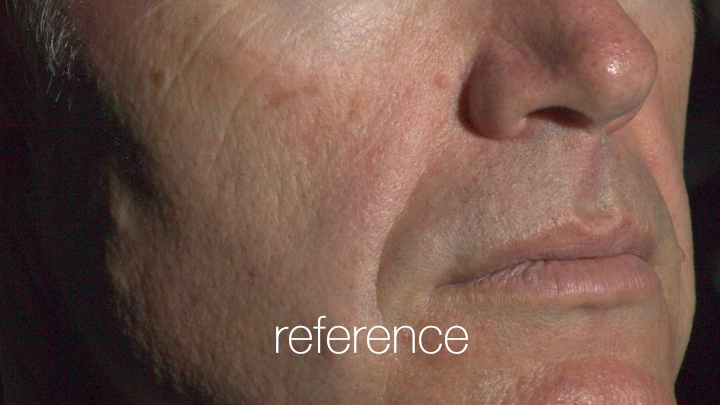 Specular: This area probably has the most change from the Wikihuman shader to the alSurface shader. First off, the Wikihuman shader uses a Phong BRDF primarily driven by the fact that the very high resolution of the displacement map would primarily drive the roughness of the specular map. 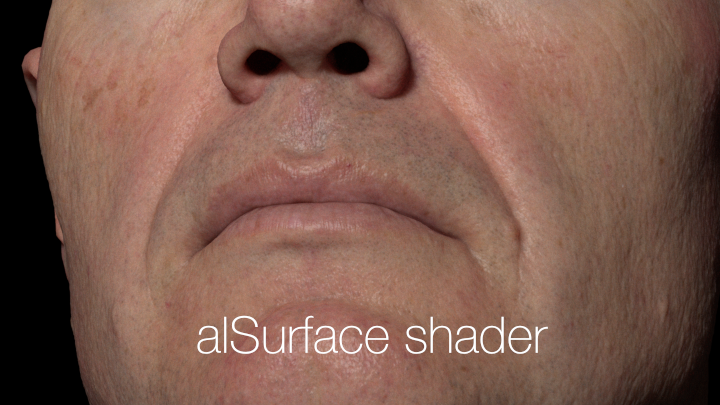 The alSurface shader only allows for Beckman or GGX as a BRDF which has it’s own micro faceting. Additionally, the alSurface shader has glossy fresnel, which effects the sharpness of the reflections at glancing angles. And last but not least, as we noted earlier, the Wikihuman shader added as opposed to mixed the reflection on top of the SSS and diffuse as to not block their effects. 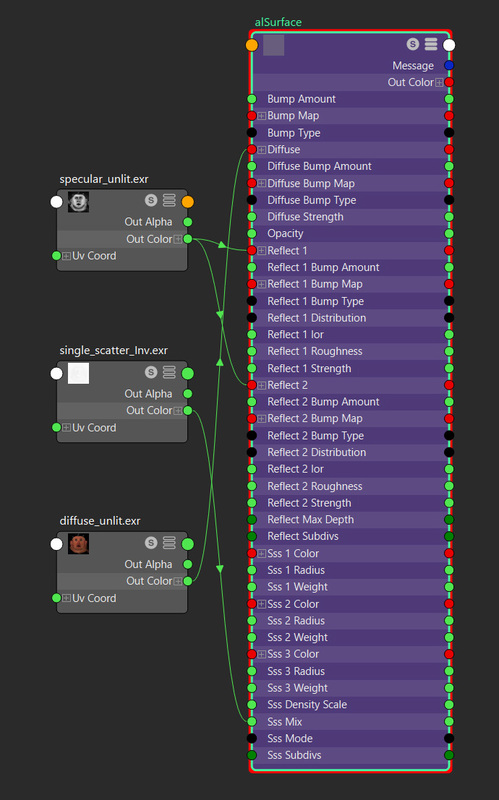 The alSurface shader does not block the diffuse and SSS at the glancing angles while still keeping with preservation of energy. Based on the renderings you can see that several improvements with the alSurface shader. The overall SSS is more balanced and does not have any extra glows around the nose and lips as we experienced from the older shader. 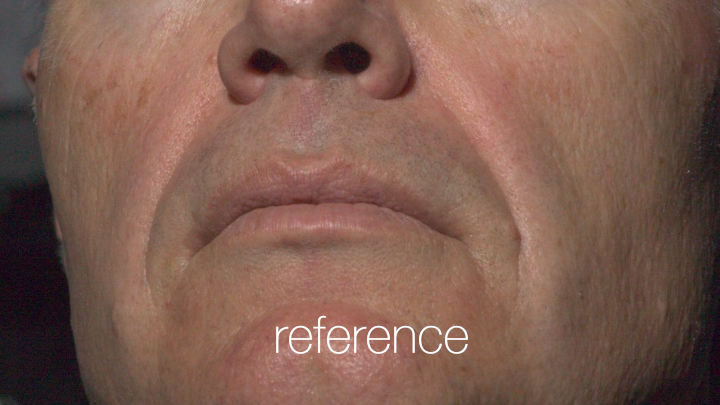 Additionally, we know that the specular is blended correctly through the SSS. While the GGX BRDF insures that we get retro reflection at glancing angles, it is debatable if this is correct since the micro displacement should take care of this on it’s own. These are early results using a data set that is still very much under development. We are still investigating all the results. 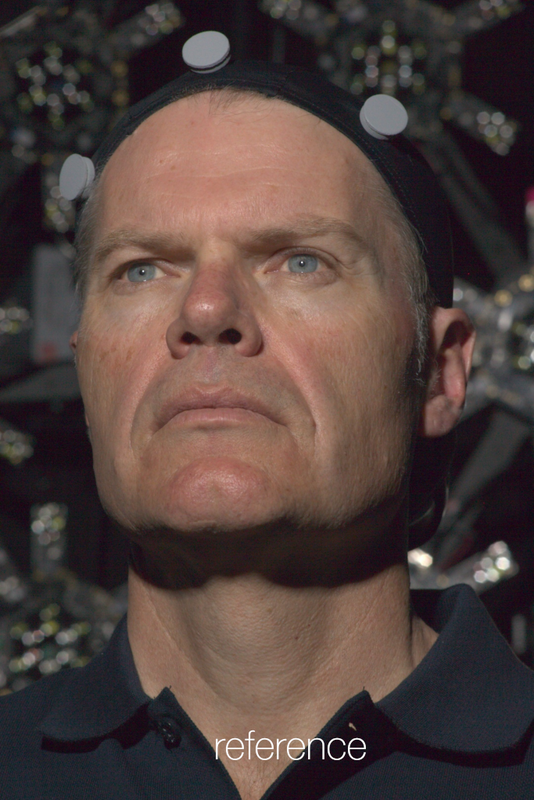 The eyes are temporary as we are working on some extremely high quality eyes. The hair, eyebrows, and eyelashes have not yet been addressed. as for matching the reference i thing with a calibrated HDRI to provide the same lighting it’s possible to get even closer result to the reference , especially taking the fact using the same model which has the same primary and secondary ” maybe ” blurred tertiary details for the last one it can be replaced with patches to mimic it . We place the lights based on the actual lightstage so that we get the correct falloff. One of the reason that the renders are slightly more contracted is because we don’t have an ambient hdri yet. Check out the dmfp, it feels a bit longer with the alsurface shader. You can see especially around the nose. Could be close surface proximity bleed too. Lastly, I can help with eyes if you need. I had done full screen 2k renders before. Amazing work! Really nice to slide and see the difference with the ref! finally getting rid of the Vray sss , though I would strongly suggest to use Arnold directly to leverage the full potential of the alSurface shader. Thank you for your comment. 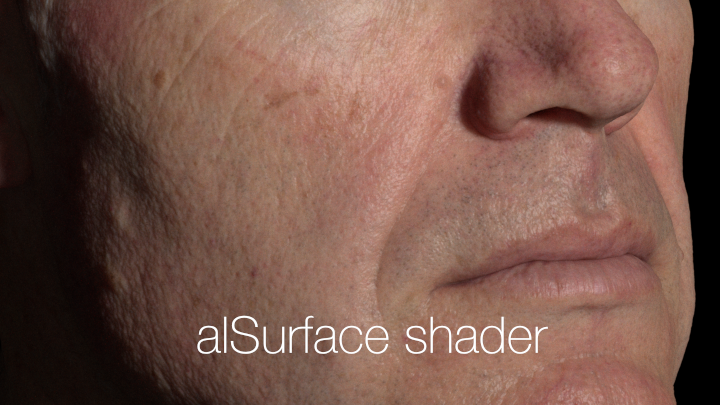 The current version of the implementation of the alSurface shader in V-Ray only takes into account the parts that are needed for SSS and Skin. Other parts will be added later. 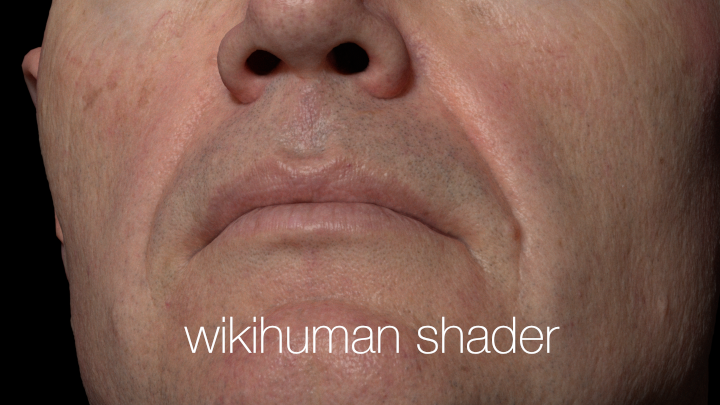 However, for the purposes of the Wikihuman project the shader is identical to using the alSurface shader in Arnold, since the math is identical. The only difference will be that the Arnold one will be slower, since it is more unbiased. You are welcome, looking forward to see this progress once Vrays limitations aren’t any causing any issues anymore. I suggest to use the scattering map in the density scale channel and and keep the mix at 1 though. Remap the greyscale to the desired value range. This way you can mimic the varying sss density across different skin areas without affecting the overall sss contribution. If you feel I can help with arnold related tests and research, shoot me a mail. Quick question regarding the Emily shader; What is the process of generating the single scatter map? Thanks for all the effort. 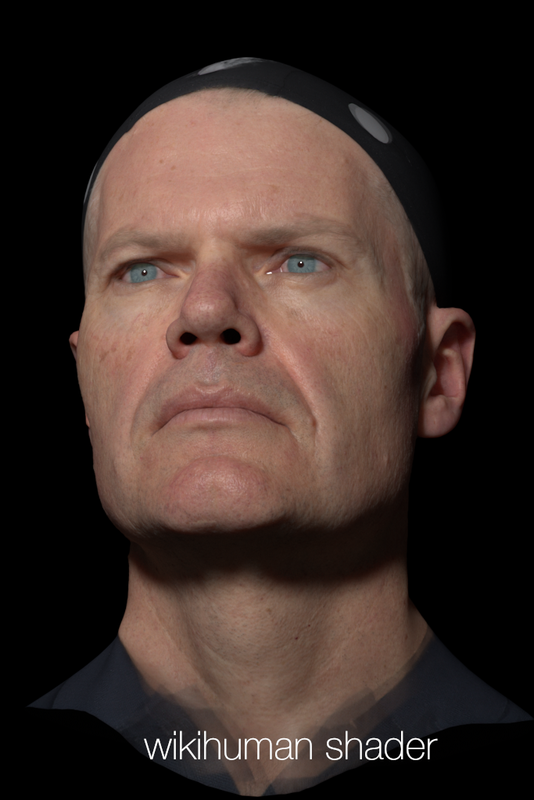 Hi, I am creating a realistic digital human from scratch using ZBrush and Max with VRay 3.4 using the Emily 2.1 shader. After doing some extensive reading on all the available papers, docs and web pages I have discovered that there is no explanation regarding the process of generating a single scatter map, all that is mentioned is it was extracted from the light stage scan data. Single scatter is not a common map type. Is there a baking sequence or app one can use? I have painted one by hand but my render results are incorrect because its not accurate. Please help. Man I just cant wait till this Data set is released. I’m really dying to get my hands on the skin and eye data to learn from it. Is there an ETA on when it will be complete? for example 1 Month or 5 months? Whats going on guys? Has the wikihuman project come to a halt? 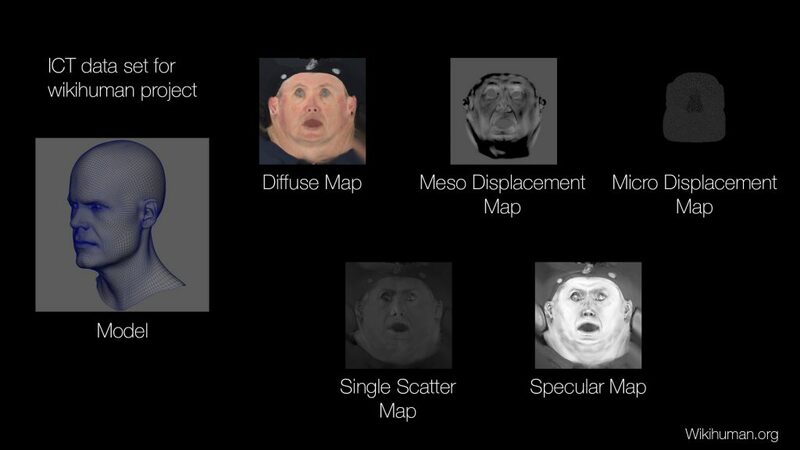 A year ago there was promise of a new updated bust dataset called Mike 1.0 with improved shader, model and released with a set of modified Disney Eye Capture eyes to go with it. As the leaders in the field all releases from you are very educational, this project is very important to me. Please I beg of you. Could you guys please get the Wikihuman project up and running again.